Program Directors are responsible for validating the competency of candidates seeking National EMS Certification. While responsibilities vary slightly by state, Program Directors are normally responsible for verifying successful course completion for all certification levels. In some states, Program Directors are responsible for conducting EMT level psychomotor examinations. If you have questions about Program Director responsibilities in your state, please contact your state EMS authority. Contact information for all state EMS agencies can be found on the State EMS Agencies page. Before a Program Director can request the Program Director role, they must have a National Registry account. If you already have a National Registry account, do not create a new account. See the section below "Add the Program Director Role to my National Registry Account" for detailed instructions. Enter YOUR email address, YOUR phone number, and YOUR address. This video describes how to create a National Registry user account. How do I add the Program Director role to my National Registry account? Login to your National Registry User Account. Click on your profile badge icon on the homepage. Click on "Add A User Role"
Select the Program Director role. The following steps are intended only for associating with a CoAEMSP accredited paramedic program. Login to your account. Note: You must have the 'Program Director' role activated on your National Registry account. If you do not already have this role, or you do not have an National Registry account, see the How To Guides listed above. Click on the Account Settings button on the left-side menu. 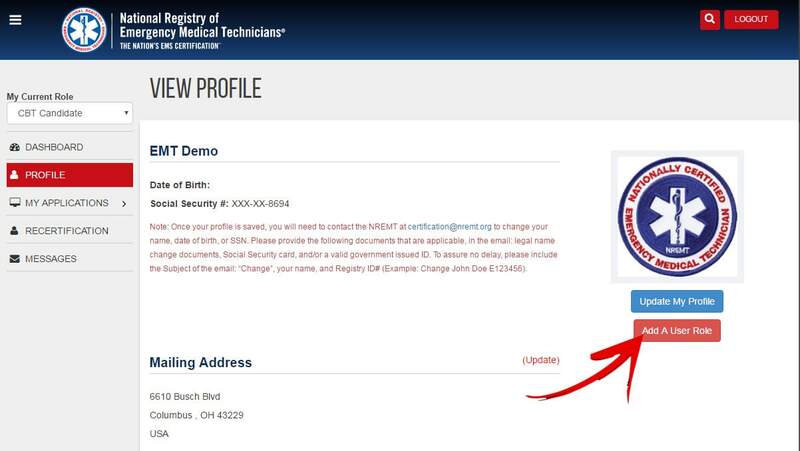 Under the Program Director Settings section, click on Request for EMS Program Authorization. 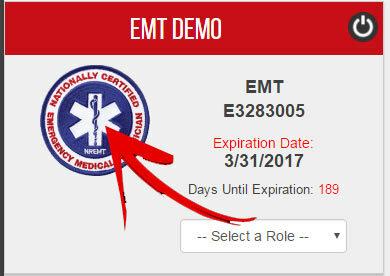 Click on Associate with an Existing EMS Education Program. Click the appropriate radio button to select CoAEMSP/CAAHEP Accredited or Letter of Review. CoAEMSP will recieve the Program Director Change request and approve or deny the request in accordance with their organizational policies. Please allow 7 - 10 business days for CoAEMSP to process your request. The following steps are intended only for program directors associating with programs that do not teach the paramedic course curriculum. Your state will receive the Program Director Change request and approve or deny the request in accordance with their organizational policies. Please allow 7 - 10 business days for your state to process your request. If your request is not approved within the suggested timeframe, please contact your state office of EMS. You must have the Program Director role activated on your account. If you do not have a National Registry account, you must create one. Those steps are also listed above. Click on Request Authorization of an EMS Education Program. After you submit the New Program Request Form, it will be sent to either CoAEMSP for Paramedic Programs, and/or to your State Office of EMS for EMR, EMT, and Advanced-EMT programs. As program director, you are responsible for verifying when your students have completed a state-approved EMS course. Detailed instructions on how to make the necessary verifications are below. If you need additional assistance, please contact the National Registry at 614-888-4484. We’re ready to help! If you do not already have a National Registry account with a username and password, create a New Account on the National Registry homepage. If you forgot your username or password, use the Password Recovery Page for assistance. To verify course completion, click on ‘Course Completion Verification’ on the left side of the screen. If your State permits, you will need to verify the Psychomotor (Practical) Examination of your students. Advanced level candidates (Advanced-EMT and Paramedic) may take the psychomotor evaluation (practical exam) following completion of the didactic and laboratory portions of an approved program if permitted by the program director and the State EMS Licensing Agency. Advanced level psychomotor examinations will be verified by National Registry Advanced Level Representatives. What is the difference between an assessment and a certification exam? When candidates create their initial application, they will need to select an Application Type. 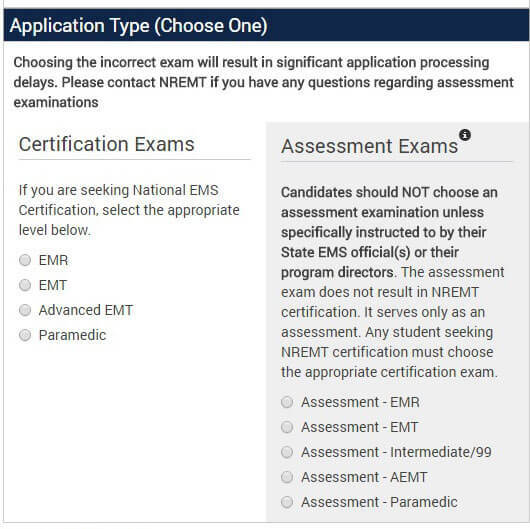 All candidates seeking National EMS Certification at the EMR, EMT, Advanced-EMT, or Paramedic level should choose the appropriate Certification Exam. Assessment exams DO NOT result in National Registry certification. Typically, candidates should NOT choose an assessment examination unless specifically instructed to by their State EMS official(s) or their program directors. A candidate who has been instructed to take the Assessment Exam by a State EMS Office.